Goji berries (or Gou Qi Zi) are both a food and a herb in Chinese medicine, used for nourishing the Yin and replenishing the Jing or essence of the body. Like all berries, goji are high in antioxidants and betacarotenes. Free from refined sugar and high in protein, these energy balls are great to have on hand when your next snack attack hits. Soak the dates and berries in a small amount of water if they are very dry. Drain thoroughly before using. Pulse the almonds in a food processor until they resemble coarse breadcrumbs. Add the other ingredients one at a time, continuing to pulse until they are combined. 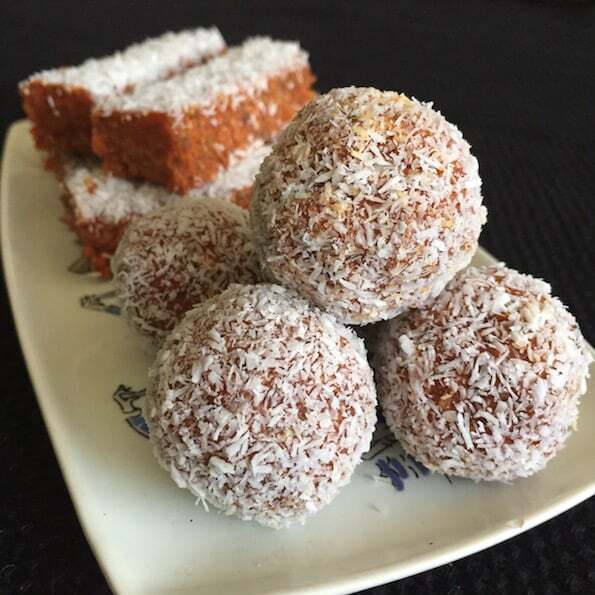 Once you have added all the ingredients, roll into balls, then roll the balls in coconut. Alternatively you can press the mixture into a lined slice tray – aim for the slice to be about 2cm thick. Set in the fridge for an hour or so before cutting into bars.